Come to grips with a cup that won't slip!Leak-free toddler cup with soft, silicone straw Ri..
Super soft silicone straw and spout for baby Ergonomic handle easy to hold Hygien..
FARLIN Non-Spill Magic Cup Spout is very convenient especially for outings. It can be used for filli..
Easy drinking, super soft silicone straw & spout for baby Ergonomic handles easy to hold Hygie..
facilitates learning to drink alone soft mouthpiece "silicone non-stick" bottle made of polyp..
Cup, for children from 14 months, ideal outside the home: sliding closure to keep the cannuccci..
RIM SPOUT TRAINER SIPPY CUP has a narrow-edge bite-proof spout and a unique ergonomic design that..
No spill sippy cup with sip activated flow for spill-free drinking or remove the spill-proof valv..
RIM SPOUT TRAINER SIPPY has a narrow-edge bite-proof spout and a unique ergonomic design that enc..
Soft and flexible silicone spout that is gentle on baby's sensitive gums Spill-proof system to ..
360 RIM TRAINER SIPPY CUP with a clear silicone membrane that allows liquid to flow wherever lip .. Plastic Imported Includes a spill-free hard spout and detachable valve The spill-free hard .. Helps with the transition from bottle to cup It is BPA-free and has a soft spout with a spill-p..
Click Lock leak-proof design Soft, silicone flexible spill-proof straw BPA free Top rack di..
Tell your kids to get a grip when they sip. This fun-to-grip contoured cup makes it easy for little .. 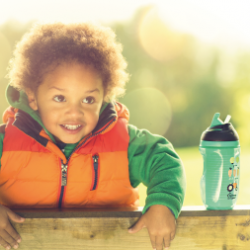 Perfectly sized for active bigger kids, this cute and convenient sports bottle features a locking li..
Use the NUK Learner Cup to easily promote your baby’s transition from breast or bottle to cup. This ..
Spill-proof Soft-spout made from silicone. Gentle preparation for drinking from an open cup. .. Holds 250 ml, for children from 12 months of age Teaches drinking without your help with two di.. Holds 250 ml, for children from 8 months of age Teaches drinking without your help as if from t..
Our all-in-one solution helps transition toddlers from sippy cup to big kid cup. With a no-roll squa..